The 2007 Cheval Blanc has a refined bouquet with scents of red berry fruit, leather, iron filing and orange rind, perhaps a little more advanced than some of its Saint Emilion peers, but still attractive. The palate is medium-bodied with grainy tannin on the entry. This is a "stocky" Cheval Blanc, with the Cabernet Franc component really forming the backbone to this wine, imparting bell pepper and spice box notes towards the grippy finish. I think it might have peaked a couple of years ago, so drink now and over the next 15 years. Tasted February 2017. 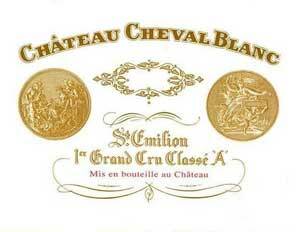 The Cheval Blanc has a deep garnet/purple colour. The nose is reticent at first, it definitely needs time so wait 3 minutes and it unfurls some attractive earthy aromas with tobacco becoming ever-stronger with time. The palate is very intense, superb acidity and what I really like about this year’s Cheval is the tension in the wine (a while since I mentioned that at en primeur.) This Cheval Blanc has a sense of urgency that I adore. Very well defined on the finish – masculine, almost Cabernet Sauvignon in quality but I think this is one of the few 2007’s with long-term potential. Great wine. Tasted April 2008. (a 54/46 blend of cabernet franc and merlot) Good ruby-red. Pure nose offers blackberry, violet, licorice and bitter chocolate. Supple and sweet, with nicely integrated acidity that's in harmony with the wine's silky texture. Just a tad peppery; I looked for a bit more thrust. Best today on the finish, where the suave fruit shows a lovely restrained sweetness and spreads out to saturate the palate. This is around 13.5% alcohol, with a bit of saignee done for the merlot. There is a wonderful violet fragrance on the nose, lots of black fruit behind this, bilberry and bramble lifted by a touch of green pepper. The palate has layers of flavour, fleshy richness beautifully balanced by red fruit freshness, a lovely complexity. The finish is very long and there is the feel of more fruit to show. 2013-2026. The trademark elegance is there in the bouquet which shows a poise and freshness of fruit (55% Cabernet Franc in the blend). The palate also shows smoothness and suavity of texture with a crisp tannic edge but the finish is just a little less polished than the rest. Drink 2013-2020. 4 stars.